If you have any questions or want to enquire about dates, use our form to contact Mimma Gagliardi or see their website for more information. Beach flip flops, your own loungers, a free mini-bar, fresh fruit while sunbathing… and five types of cake at breakfast, almost always served out by the pool thanks to year-round sunshine. The dress code is simple. Bathing suit by day, then later something arty and colourful for pool-side drinks and a meal in the bamboo-roofed Michelin-starred restaurant. Natural foods are on the menu: fresh salads and seafood with herbs from the garden and a hint of Calabrian hot pepper. Wines are local, and so too are the wood carvings, abstract artworks and naïve tiles created by master craftsmen and artists. 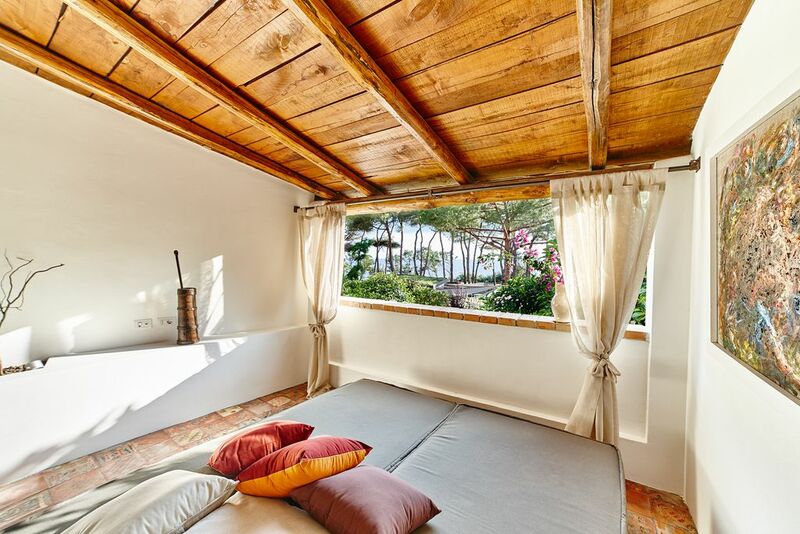 Bedrooms, each with a private terrace, cluster amid pine trees a quick flip-flop from the beach. With their warm peach or green walls and über-modern bathrooms – rain showers, glass sinks, fluffy robes – they make a cosy retreat for couples. Take a good map as the resort is well hidden in a quiet complex by Capo Rizzuto marine reserve. Tucked in Italy’s toe, the province of Crotone is blissfully free of tourism yet filled with attractions from Capo Colonna archaeological park to the wild beauty of Valli Cupe’s waterfalls. Closed October 16th - April 30th. Have you visited Praia Art Resort? Be the first to leave a review. An unexpected haven set like a jewel in this unique location, just 20m from the beach. A place where you can enjoy the natural caressing concert notes of the waves rolling on the shore, the warm sounds of the wind and the cicadas in the pines. In this corner of paradise in Calabria you can choose to rest by the sea or discover an ancient land rich in tradition, culture and natural landscapes. A few kilometers to reach the National Park of Sila, where nature becomes the main player in an itinerary where hills and mountains compete and vegetation makes room for the oak, beech, fir and pine trees. in Sila Piccola, in the surroundings of Sersale and the other neighbouring mountain villages, marvellous and incomparable geologic monuments rise up, the canyons of Valli Cupe, that represent genuine natural jewels, with hundreds of spectacular waterfalls. There are villages like Santa Severina and Gerace (among the most beautiful villages of Italy), which are sublime expressions of the Byzantine culture in Calabria. There's Crotone, the town of Pythagoras and gateway to Magna Graecia. This land boasts an incomparable culinary excellence: the red onion of Tropea, the potato of Sila, the tomato of Belmonte, the liquorice of Rossano, Calabrian peperoncino, 'nduja, sardella and Ciro' wines.